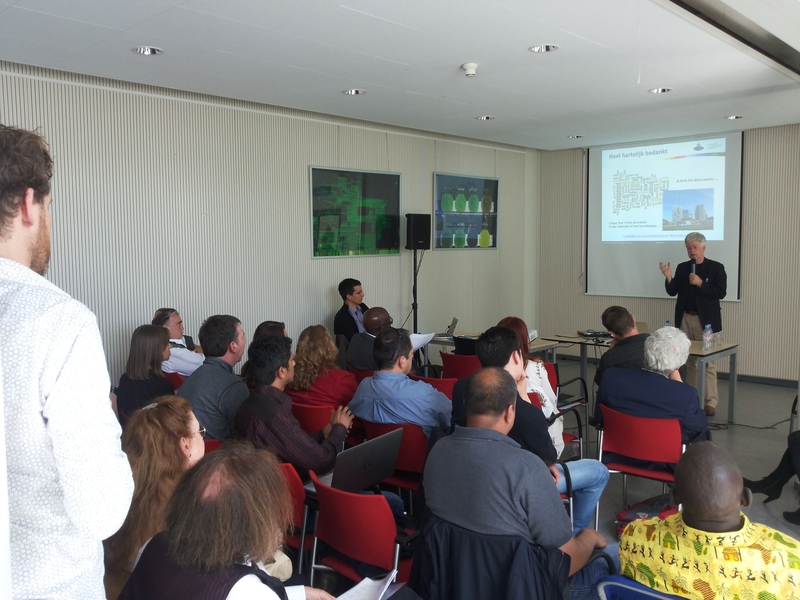 On 16 May 2014, the symposium “Perspectives on ICT for Development” (ICT4D) was held at VU University Amsterdam. The event featured international speakers from different backgrounds, who were asked to present their perspective on the principles, practice and scientific background of ICTs for Developing countries. The symposium was a great success, with over 100 participants that came from all over the world, bringing their expertise to the discussion floor. 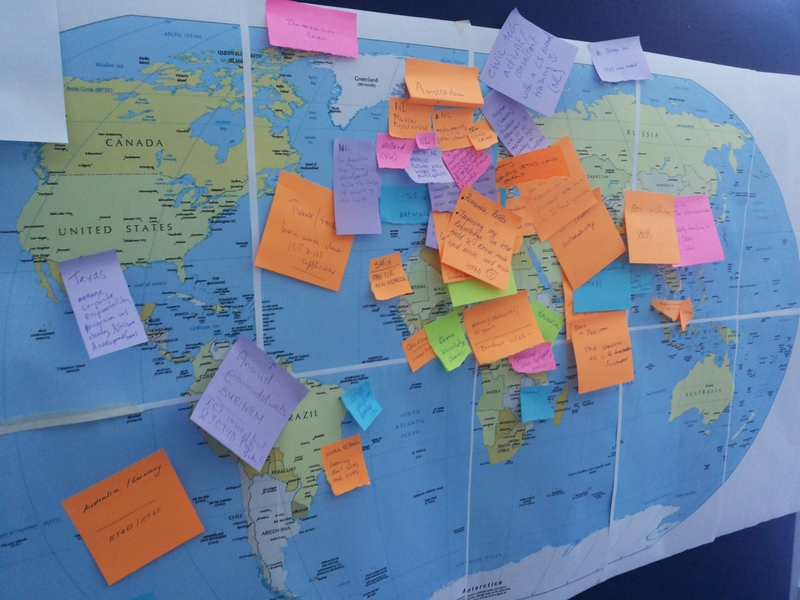 During breaks, these participants were asked to share their background and thoughts on a number of ICT4D issues by sticking colored markers on three poster boards. The results are shown in the three pictures below. During the lively discussions the different perspectives were highlighted. Discussions were kickstarted by asking audience members from different disciplines to comment on a speaker’s viewpoint. Students were asking practitioners, regreening experts discussed knowledge sharing with computer scientists etcetera. This resulted in many multidisciplinary discussions throughout the day. The board shows the location of origin of the participants. 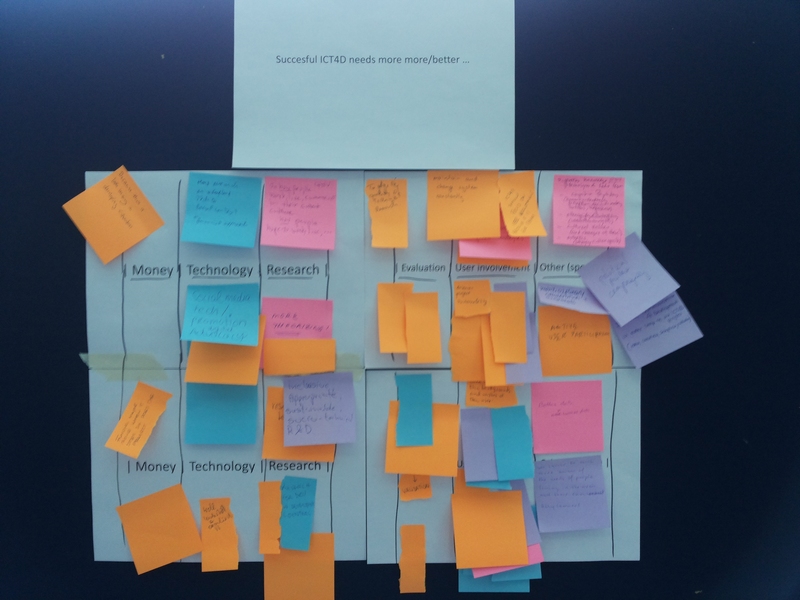 There are five color post-its indicating the background (orange = computer scientist, pink = social scientists, blue =ict4d practitioners, green=development practitioners and purple = other). The results show a wide geographical spread of participants. 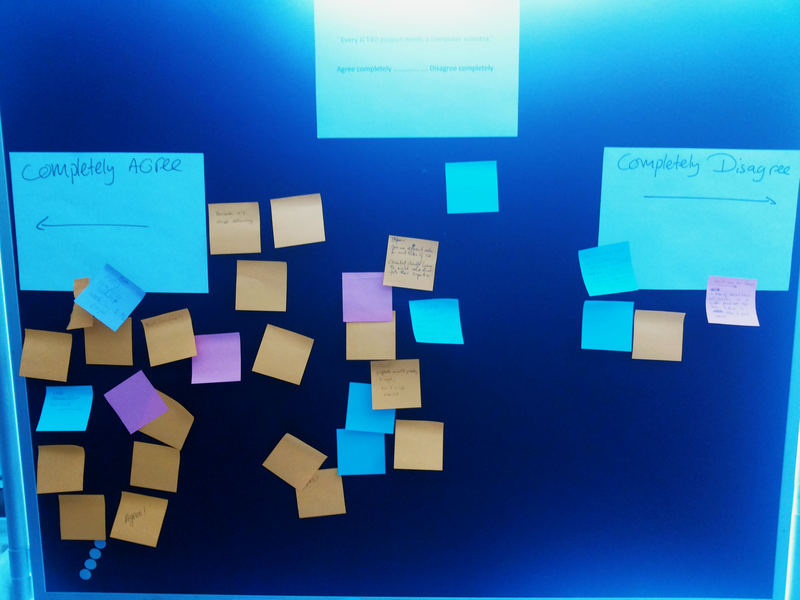 Board 2: “Succesful ICT4D needs more more/better …Money, Technology, Research, Evaluation, User involvement, Other”. Here it seems that Computer Scientists think more User Involvement is needed, whereas practitioners see the value of more technology. Board 3: Finally, participants were asked to mark their agreement with the statement “Every ICT4D project needs a computer scientist”. Surprisingly (or not) it seemed that most agreed, although some practitioners (and computer scientists) disagree. The entire event was broadcast live on the Web, with viewers from as far away as Liberia and Nigeria. The entire symposium is archived online on youtube. The first speaker was Stefan Schlobach, [watch on youtube], assistant professor of Artificial Intelligence at VU Amsterdam, and coordinator of the Master Course on ICT4D at VU’s Computer Science Department. He highlighted the Computer Science perspective of ICT4D, identifying a number of interesting research challenges from CS subdisciplines such as Human-Computer Interaction, Knowledge Representation and Information Retrieval. Next up was Mirjam de Bruijn [watch on youtube] , professor of contemporary history and anthropology of West and Central Africa, at the African Studies Centre, Faculty of Arts, Leiden University. Her talk “Mobile Africa Revisited” presented a number of of how the introduction of ICTs (specifically mobile phones) changes the lives of people in developing countries. Her research shows the need to consider the profound transformative effects that ICTs can have but also its limitations. Professor Saa Dittoh from the University for Development Studies in Tamale, Ghana and Wendelien Tuyp from the VU next talked about the role of communication and knowledge sharing for regreening efforts in Africa [watch on youtube]. They provided insight in grand-scale agricultural issues and how local innovative farmers are making a difference. After the lunch, mr. Amadou Tangara from Sahel Eco (Mali) and Stéphane Boyera of SBC4D consultancy held a duo-presentation on Mobile and Voice Technologies For Social And Economic Development [watch on youtube]. Their talk highlighted the potential of mobile and voice technologies for information sharing and Mr. Tangara presented a number of the voice systems resulting from the VOICES project. The penultimate speaker was Tim Unwin [watch on youtube]. He is professor of geography at Royal Holloway, University of London and UNESCO Chair in ICT4D is also the editor of the book “ICT4D” (Cambridge University Press, 2009) which was used in the ICT4D VU course. Prof. Unwin presented a very inspiring, high-level and highly skeptical look on the merits of ICT for development, focusing on the question whether the practice of ICT4D is actually helping the most marginalised communities rather than widening the gap. He cautioned for careless optimism that often surrounds technological advances and urged the audience to rethink their focus and approach. The closing speech was given by VU University’s own prof. Hans Akkermans[watch on youtube] who also discussed the scientific backbone of ICT4D practice. In his talk he discussed the role of the (computer) scientific method and computer scientists themselves in ICT4D asking “what the sheep can do for the goats” and vice-versa. He posited that ICT4D presents “extreme” research challenges for computer scientists, referring back to the first speaker’s talk as well. The wonderful symposium was sponsored by VU Computer Science, the Network Institute and VU international Office.